We are one of the largest independent academic booksellers in the UK. We're open throughout the year whatever your book requirements. From the moment you consider Canterbury Christ Church University as an undergraduate to post-graduate studies - we’re here for you. Since the mid-1970s we have supplied books to our students and alumni as well as the general public. 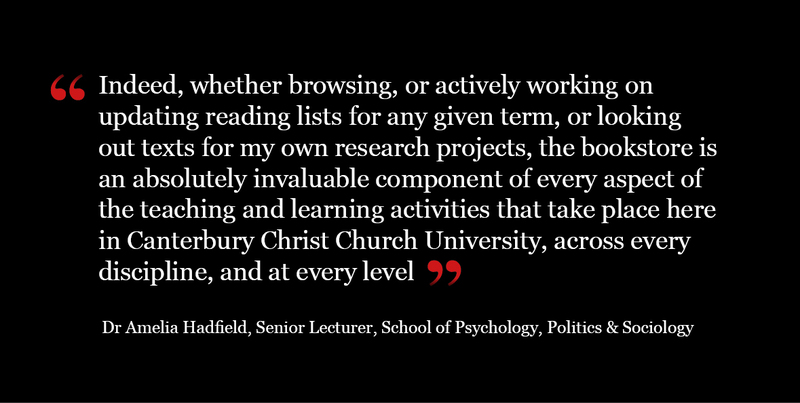 We are here to support academic research and study across the University and beyond. In fact, with over half a million general and academic titles available to order for the following day from us - there's not much we can't do. But it's not just about the set texts, we stock a wide range of books supporting your chosen subject area. From Christopher Robin to Christopher Hitchens we can source any book currently in print. Any title not available for next day is usually supplied within 3 to 7 days. And practically all books are automatically discounted by 10% with greater savings available on core textbook bundles and newly-published titles. Just ask for a price-check at the counter or drop us an email. We're happy to check availability and prices of individual titles or booklists of your recommended for purchase titles. We strive to give you the best deal as your on-campus university-owned bookseller. We support many events over the course of the academic year from conferences and public lectures to book signings and author events. We are proud to provide bookshop services to the Canterbury Festival (14 Oct - 4Nov 2017) and the Folkestone Book Festival (17 - 26 Nov 2017) Our recent author readings have included Louis de Bernières, John Boyne and Anthony Browne. All our events – with many pictures – are posted to @cccubookshop on Twitter. We are also the official stockist of CCCU merchandise from the original tie and college wrap (scarf) to the ever-popular teddy bear and our range of Fairtrade cotton clothing. A giftshop is available at graduation ceremonies and items can be purchased throughout the year and by mail order through our website. 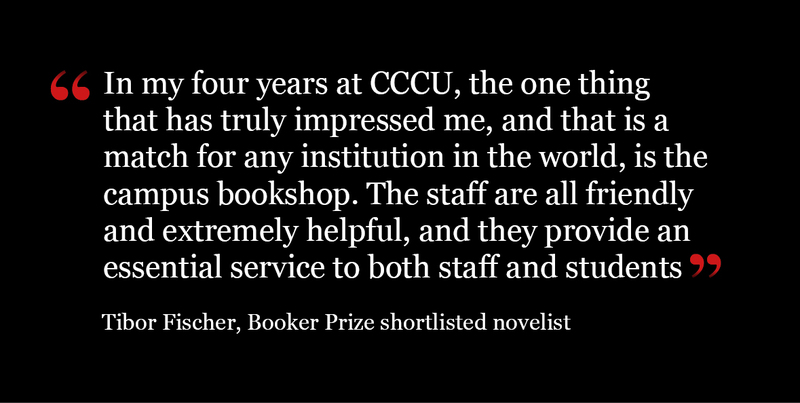 The bookshop was established by Canterbury Christ Church College in the mid-1970s to serve the needs of students and staff. As such we play an essential role supporting the learning experience of students, and the teaching and research work of staff. We are fully engaged in the cultural life of the University, helping to shape the social and spiritual environment. 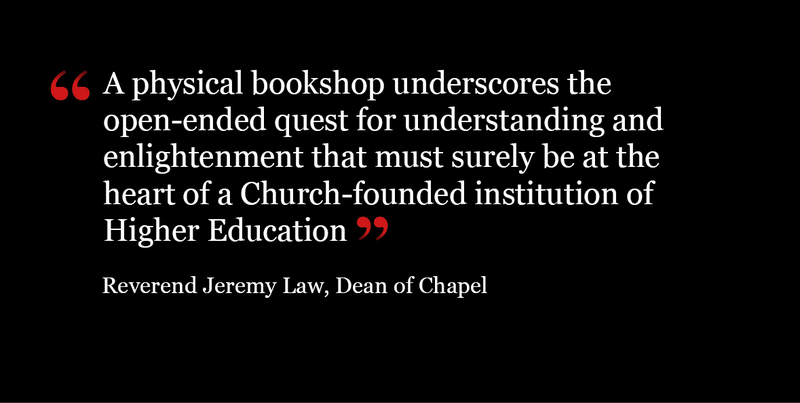 An academic bookshop on campus is a key asset for a vibrant learning community.